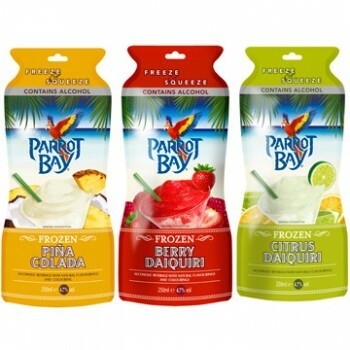 Diageo has announced plans for a national roll out of Parrot Bay “freeze and squeeze” cocktails, following a successful trial in 2012. The cocktails will be available nationwide from April and the range comprises single serve, ready-to-drink cocktails in three flavours: Berry Daiquiri, Citrus Daiquiri and Pina Colada. The cocktails are frozen before consumption and come in a liquid pouch format. Louise Robbie, senior innovation manager at Diageo GB, said: “Following explosive growth of frozen alcoholic cocktails in the US, we have tested Parrot Bay ‘freeze and squeeze’ cocktails in three European countries and seen great results across the board – so now is the time to roll the product out further.